The world is full of airborne contaminants. The human body comes factory-fitted with its own basic respiratory protection - we trap and clear dust and fibres in a matter of hours from our lungs. While this system copes quite well with everyday, low concentrations of contaminants, it has trouble when we try to deal with anything more substantial or exotic, such as high concentrations, radioactive particles and biological microorganisms. 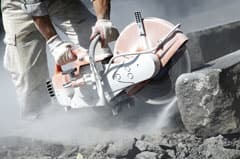 The trouble is, modern processes and materials, especially those involving power tools, produce airborne debris and vapours in high concentrations. We then need additional protection. In safety, we are all familiar with the mantra of the hierarchy of control. Simply put, it just means that some ways of dealing with risk are more effective than others and those that are more effective should be considered first. Effectiveness varies with context, but there are some general principles. Attempting to eliminate risk comes high on the list, but this idea can go by different names. The concept of inherent safety, for example, is promoted in process industries. Inherent safety means a dangerous situation will not develop, even if things should fail or go wrong. This is usually achieved by plant/process design or choice of raw materials, which remove components, process steps, hazardous chemicals, extreme operating conditions, and reduce complexity. Alas, risk cannot always be eliminated or even reduced to acceptable levels using this approach alone - the world is never quite so neat. Woven into this hierarchy is the concept of collective protection versus personal protection. Again, given a choice it is better to protect everyone using, say, a non-personal engineering solution, rather than relying on each person wearing something. That's probably obvious, because even the casual observer can see that people don't always wear things when they need to, don't wear them properly, don't maintain them, or don’t replace them when they are damaged or worn out. In our world of three lettered acronyms, PPE reigns supreme. Within its remit comes RPE, or respiratory protective equipment. According to the hierarchy of control, PPE is supposed to be used as a last resort, that is, only used when all other controls have been exhausted. We also know, however, that PPE is in fact very widely used. Last resort, therefore, does not mean it shouldn't be used - PPE is widely used in combination with other methods because it significantly enhances safety at a very reasonable cost. Sometimes it's used temporarily while better measures are being installed; sometimes it's the only practical solution - such as in an emergency. If it can be personalised and made to look good then so much the better - it is personal after all. To some people it may at first seem unnecessary, superficial, even vain to care that a good range of stylish designs is now available, but they are missing the bigger picture. While style is a secondary consideration, it can make users more likely to want to wear it, and anything that can improve safety is a good thing. RPE falls into two basic types: respirators and breathing apparatus. Respirators simply filter the surrounding contaminated air, e.g. filtering face-piece respirators, dust masks, vapour masks. Some of these are disposable (single use) and very cheap. As such, they are widely used in both industrial and domestic applications. Breathing Apparatus (BA), on the other hand, provides or draws from an uncontaminated source of breathable air, e.g. self-contained BA (SCBA) or airline BA. Both types can be powered or unassisted (relying on the wearer's own effort). Both types of RPE can also rely on tight fitting to the face or be loose, like a hood or helmet/visor arrangement. Loose fitting types rely on positive pressure of clean air and so need to be powered. The choice of RPE available on the market may seem bewildering, but working out what you need isn't that difficult. The first thing to note is whether or not you have an oxygen-deficient atmosphere. Respirators are not going to help you if you don't have enough oxygen to breath to start with, because they simply filter the air. So, if the oxygen in the air is likely to be too low or get seriously diluted/displaced by another gas (inert or toxic), the only choice for RPE is special types of BA. This is therefore often the RPE of choice in confined spaces work. Of course, you may still decide to select from types of BA, even if the air technically has enough oxygen in it to breath e.g. if the contaminant is highly toxic. It goes without saying, but I'll say it anyway - you should make sure that the RPE is good quality, conforming to any applicable standards. In Europe this means CE marking, but whatever meets or exceeds the local requirements. If there are no local requirements, use international standards. You need to take account of the overall risk in selecting RPE - it's not just a case of selecting the RPE with the highest protection stated by the manufacturer. The UK’s HSE, in partnership with others, has an online tool to help you select RPE. It's based on simple information about the substances, amounts and methods being used (see www.healthyworkinglives.com/rpe-selector/). This can greatly help you narrow down choices. The following considerations adapted from that selector tool need to be taken into account when selecting RPE. Filter type (for respirators only) Think about the hazards you are trying to protect against. Dusts and fibres require particulate filters; vapours and gases require gas filters. The filter can be very specific to the nature of the particulates (e.g. size) or gas/vapour, so choose wisely. Manufacturers will normally have selection tables for this very purpose. Level of protection needed RPE uses a system called Assigned Protection Factor (APF). A higher APF means better protection. This is a relative, rather than absolute, system - the APF is the factor by which the RPE reduces the contaminant concentration after it passes through the filter. An APF of four, for example, means that the concentration will be reduced to a quarter. So, if the air is 100ppm outside the mask, it will be 25ppm after it has been drawn through the mask for you to breathe in. This APF system assumes we live in an idyllic world in which everyone is well trained, RPE fits and functions perfectly, and everyone does what they are told. Needless to say, expect it to offer less protection than this. You should be aiming to reduce the concentration inside the respirator to below any applicable occupational exposure limit (OEL). The APF you typically need for common tasks can sometimes be found on safety data sheets, recommended by manufacturers, or using the tool I referred to earlier. It is also possible to calculate the APF based on measurements of the contaminant level in the workplace and knowledge of the OEL. Then choose RPE that has an APF which exceeds this. The wearer There are factors related to the intended wearer that can affect choice. Chief among these is face fit. Facial features such as scars and beards, as well as the shape and size of the wearer’s head and face can affect how well RPE fits, which is of prime importance for RPE that relies on a tight face fit to be effective. In fact, for such RPE, you should carry out a formal fit test to make sure the selected RPE fits the wearer and provides a good face seal, operating as intended. In addition, every time it is worn the wearer should do pre-use checks (looking for defects) and fit-checks (adjusting so it fits/works properly). Loose fitting devices like hoods and visors don't really have this fitting issue, because they don't rely on a tight seal for effectiveness. They still need to fit on or over the head/face, however, so may need a bit of adjustment. RPE comes in a range of sizes and designs, with adjustable straps to give a reasonable choice of fitting. Wearing an unpowered respirator, especially one of high APF, can require greater effort to breathe and draw air through the mask. The wearer may have respiratory problems that mean a powered respirator may be better suited, requiring less effort to breathe through the mask. The wearer may also need to wear spectacles. Duration, rate and compatibility of task Wearing tight fitting RPE for significant periods of time is uncomfortable and there is a temptation to remove or adjust it. It's the same with any clothing, so RPE is no different. It is therefore generally recommended that these forms of RPE should not be used continuously for more than an hour or so. The loose fitting alternatives are far more comfortable for longer use times. Doing strenuous work will not only increase breathing rate, but may also cause facial sweating. Both of these can cause more contaminant to slip through leaks in the face seal of tight-fitting RPE. The task may also require the use of other PPE such as hearing protection, head protection and eye protection, or good communication or vision. It is possible to source RPE with some of these features incorporated, like visors/face shields, hard hats, and microphones. Note that sweating can also increase misting of any incorporated visors, though anti-mist varieties are available. If you don't need a visor or shield, visibility is better without. Some forms of RPE are bulky and interfere with the work. For example, reusable respirators often have protruding filters/canisters that can easily be knocked when lifting objects or close-working and displace the respirator seal from the face. The environment Hot, humid environments will increase discomfort and make it more tempting to remove RPE if it is tight-fitting. Powered respirators can help cool you down. Unless powered respirators are explosion proof, however, they can be an obvious ignition source in a flammable atmosphere. If the environment is confined or difficult to navigate, with multiple areas of snagging, then SCBA, fresh air hose or airline BA may not be ideal. Even though some give excellent protection (high APF), they are bulky (SCBA) and, in the case of airline BA, the airline can become entangled. A powered respirator might be a better option in such cases. Wearing unassisted (non-powered) BA, like fresh air hose BA, can also be strenuous - taking effort to breathe. This is especially so with longer hoses or if the hose gets entangled. It then becomes a temptation to remove it as discomfort increases. The points detailed so far should help you narrow down the choices, but you should also consider the following. Correct use Correct use amounts to instruction, training and supervision. It is not difficult to instruct people in how to wear RPE properly. In fact, many RPE suppliers will train users for free. As already mentioned, for tight-fitting RPE, it's important that wearers check that the RPE fits properly each time it is worn (a fit check) and gives a good face seal. A fit test may also be needed the first time it is worn and repeated if facial features change significantly. Maintenance and storage Reuseable RPE can usually be maintained, but maintenance is something that is all too easily neglected. As such, valves degrade and fail, filters get clogged, visors get scratched and face seals get damaged. The result is a false sense of security - misplaced trust in your protection. Just as important as correct maintenance is storage when the equipment is not in use. Otherwise the filter may continue to absorb vapours and collect dirt and damage, and this may greatly reduce its working life and effectiveness. RPE is very often a part of a control strategy for airborne contaminants in the workplace. Life used to be so much simpler, but we now have more choice than ever before. Like many risk assessments in life, you have to think holistically. There is no point selecting an impressively capable RPE set that doesn't fit those who need to wear it or is unbearably uncomfortable. The effectiveness of RPE goes beyond the suitability for the contaminant and its APF rating. Selection needs to consider not only its basic protection rating, but also how well it fits the wearer, how easy it is to wear properly, comfort (for intended wear time), interaction with the task, environment and other PPE that may be needed and, for continued effectiveness, training and maintenance requirements. Much of this is obvious when you begin to think about it and there is plenty of help out there for those who need it. If you are in any doubt about the influence of comfort, just try wearing tight-fitting RPE for a day.